We have included all of the comforts of home, plus more. Ready for you to show up and enjoy the calming qualities of the area. 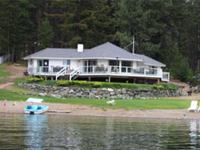 Whether you want to kick back and enjoy the spectacular views, take in a game of bocce, croquet, badminton, or spend your day swimming or fishing in one of the cleanest, crystal clear lakes in BC or the many smaller fishing lakes that surround the area. 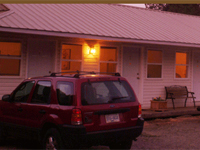 Our goal is to provide you the most comfort, to make your stay in Tulameen more relaxing and memorable. From our relaxing rooms to our location and service...the perfect choice for the whole family. The Otter Sleep Inn central location, is just a walk from the Schoolhouse Museum, public library and community hall which are located right next door. Situated just 5 minutes outside of Princeton BC in the Cascade Mountains. This little known pristine area surprises all new visitors with its amazing natural beauty and abundant recreational opportunities. Princeton?s little gem in BC is nestled in its own 110 acre valley with Allison creek gently flowing alongside the traditional log cabins. 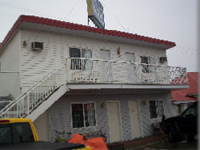 The Princeton Motel is clean and quiet, with both smoking and non-smoking rooms - ALL AIR CONDITIONED, and near all amenities. rooms are all equipped with color cable TV, with 24 hour movie and sports channels. There are direct dial phones and complimentary tea/coffee services in every room, kitchens in some rooms,fridges in all rooms. Princeton is renowned for its trout fishing and rolling grasslands that are ideal for hiking, cross-country skiing and outdoor activities. 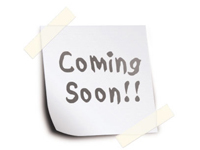 Princeton and the surrounding areas, offer a wealth of outdoor activities. The Sandman Inn Princeton is minutes from the town centre and features 52 comfortable guest rooms including kitchenettes. Enjoy on-site dining at our family restaurant. Golf packages are available. 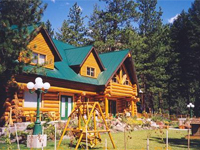 Elegantly appointed log cabin on Otter Lake, Vermillion Lodge offers an exclusive holiday destination for the whole family. Located in the Tulameen area of British Columbia Canada near Princeton B C its a first class accomodation available for rent all year round. Lodge Accommodations. Eleven bedrooms and seven bathrooms. 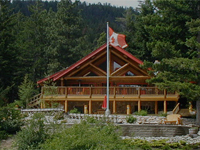 Rustic log lodge was constructed from original buildings, with bedrooms that depict old-west characters.